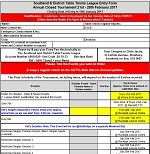 The 2018 Annual Closed Tournament will be held from 12th to 20th February 2018 Closing Date of Entry is 14 January 2018. Qualification for Senior and U21 League Playing Members (Div P/1/2) is 3 matches to be played by the Closing Date of Entry 14/01/18 For U21s Div 3 which 1 matc. The Final Schedule of the Tournament, including times, will depend on the number of Entries received. The Final Night Matches are Under 21 Singles (Inc. Semi Finals), Men's Singles (Inc. Semi Finals), Ladies Singles, The Men's Doubles, Ladies Doubles, Mixed Doubles and Vets Singles All other Finals will be played out during the Championships. Entry Fees £ 15.00 for Adults and £7.50 for Juniors. Juniors playing in any Adult Event, pays the Adult Fee of £15.